The International Celtic Conference will be taking place in the Bristol Hotel, Newquay in Cornwall, 25-30 April 2019. The theme chosen by the Cornish branch is Recording our past to help inform our future. Speaker on behalf of the Manx Branch is James Franklin, the Education and Online Resources Officer of Culture Vannin. The kind assistance of Culture Vannin in enabling James to travel to Newquay is gratefully acknowledged. We are also delighted that BBC Radio 2 Young Folk Award Winner Mera Royle and her wonderful harp playing will represent the Island in the International Concert as part of the International Celtic Congress. Very grateful thanks are due to the Davies family of Ramsey for their harp shuttle service! Our next event here in the Island is a visit to the The Centre for WW1 Internment in the Patrick Old School Rooms at Patrick Corner in Patrick Village, meeting at the Visitors Centre at 2.00pm on Saturday 4th May. This will be an opportunity to have a guided tour of the exhibition and storiesof Knockaloe Internment Camp and the people who were held there, as well as those who worked there and helped to keep it running. There is limited parking at the Visitors Centre itself, but it is possible to park on the road. This year sees the 160th anniversary of the birth of Sophia Morrison in Peel on 24th May 1859. 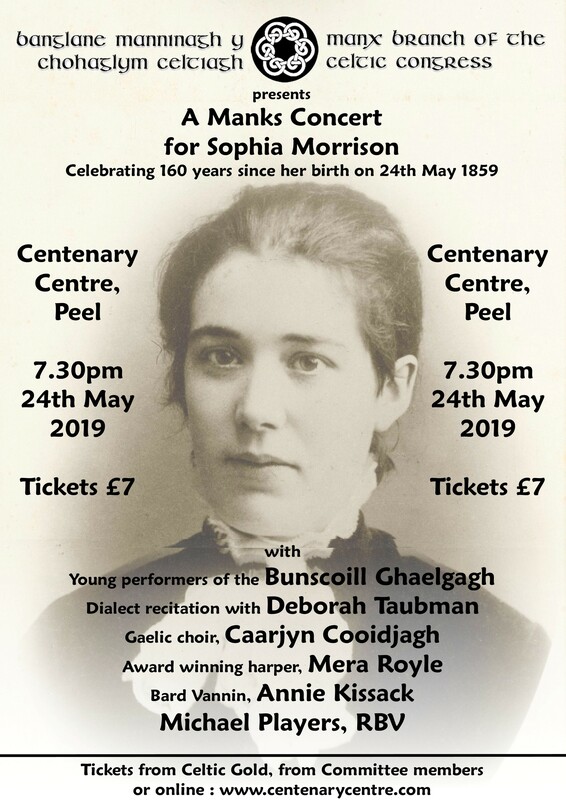 To mark that anniversary, the Manx Branch of the Celtic Congress is holding a Manx Gaelic original short-story competition for Aundyr Sophia Morrison, the Sophia Morrison Award. The announcement of the winner will be made at ‘A Manks Concert for Sophia Morrison’ which will be taking place at the Centenary Centre, Peel at 7.30pm on Friday 24th May 2019. Tickets are £7 and are available now. The Aundyr Sophia Morrison competition is for an original short-story in Manx Gaelic on any subject, with a minimum of 600 words and a maximum of 1,000 words. This is an open competition for any age of Manx writer. There is no entry fee or limit on the number of stories which may be submitted by any one author. Each story must be accompanied by a separate entry form. There is a £100 cash prize for the winning entry. You can download the entry form here. The International Celtic Congress is held annually to perpetuate the culture, ideals, and languages of the Celtic peoples, and to maintain an intellectual contact and close cooperation between the respective Celtic communities. The Celtic Congress was founded in 1917, though its antecedents go back some years before that, in order to promote the knowlege, use, and appreciation of the languages and cultures of the six Celtic countries. National Branches of the Congress meet in an International Congress each year in order to help further these aims.